Being overweight or obese is the result of consuming too many calories and expending too little energy. Having too much body fat for your height and weight can lead to numerous physical problems such as diabetes, cardiovascular disease, stroke and hypertension. Even losing 5 to 10 percent of your body weight can help prevent some of these conditions. Green tea and cinnamon may help in achieving your weight loss goals, but check with your doctor. 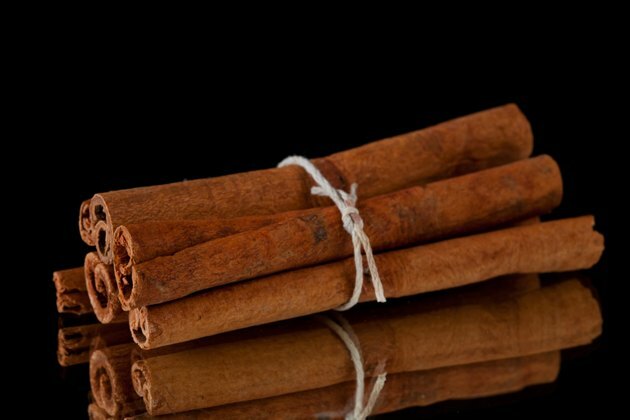 Knowledge of the health benefits of cinnamon dates back as much as 5,000 years. First used by the Egyptians, then the ancient Romans and Chinese, it was used not only as a spice for foods, but also for its medicinal properties. Cinnamon comes from the bark of the cinnamon tree. It is sold in rolled scroll-like cylinders called quills, and as ground powder. Two types of cinnamon exist, Cassia, which is more refined and slightly sweeter, and Ceylon, which is the type you normally see on your grocery shelf. The interaction between insulin secretion and blood glucose plays a role in metabolism, especially if you are insulin resistant or have diabetes. A 2003 study published in the professional journal "Diabetes Care" set out to find if cinnamon affected serum glucose in people with type 2 diabetes. After 40 days of receiving 1 to 6 g of cinnamon supplements daily, the test subjects showed significant reduction, not only in fasting blood glucose levels, but also in total cholesterol, LDL cholesterol and triglyceride levels. Controlling your blood glucose levels may help in weight control, especially if you have diabetes type 2. China and India were the first to cultivate the Camellis sinensis plant from which green tea, black tea and oolong tea come. The distinction between the three is the fermentation process of the leaves. Green tea leaves are unfermented, oolong leaves are only partially fermented and black tea is completely fermented. The more the fermentation, the more the caffeine and the less the polyphenols. It is the polyphenols that give green tea its medicinal properties. A group of researchers put forward that green tea may affect the sympathetic nervous system, the part that controls your internal organs and your reaction to stress. The study published in the "American Journal of Clinical Nutrition" gave green tea extract to a group of subjects and then watched for any change in a 24 hour expenditure of energy and fat oxidation. It found that green tea possesses thermogenic and fat oxidation processes which may activate the sympathetic system. This may result help in losing weight.